Whether this is the idea behind my job title remains to be seen. The fact that there are a good proportion of women there, in engineering and other positions, suggests that this may be the case. Mine is a newly created position, assuming some duties of an office manager, but seemingly with expectation for creative thought and original ideas. Writing and editing skills were also high on the list of criteria, as was integration into the existing office culture, and some background in financial reporting. summer will be spent learning the new job, and puttering in my little yard when the weather is good, finishing up renovation odds 'n ends inside when the weather isn't good. 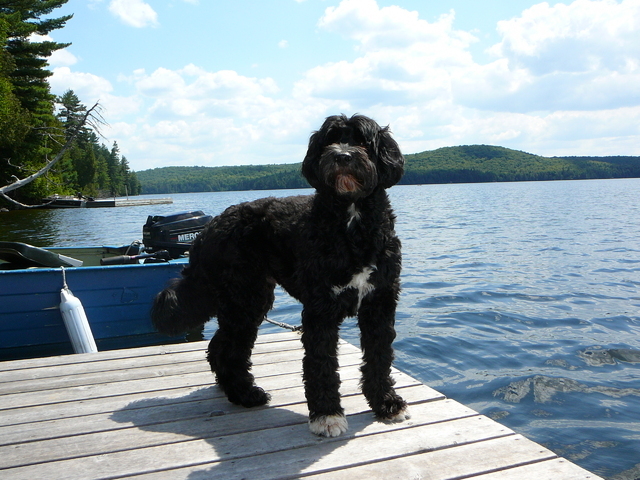 Perhaps a few jaunts with the dog and the kayak to nearby lakes on long weekends .....a toast to new beginnings. this isn't a picture of Maestro, but it looks so much like him I couldn't resist including it. good luck with your new job, it sounds very interestig. I love the summer plans for kayaking with Maestro, wish I could join you! thanks for the good wishes, Claire. i wish we could do a paddle together too. perhaps one day..... good luck to you in your new home. I have every confidence the title of 'Office Catalyst' suits your skills and experience beautifully. I wish you all the best in your new career but before that, during, and all the times between I hope your days are bright and clear. After all, it's so much easier to go kayaking when you can see. Pats to Maestro. Congrats on the new job. I'm sure you are up to the task of this new job title! Ahhh, how pleasant it sounds to be bobbing around on the water in your kayak with Maestro ... hopefully he enjoys it too! Otherwise, it could be interesting. Good to know about your blog i have visit and i like it you have shared such a nice and useful ideas..